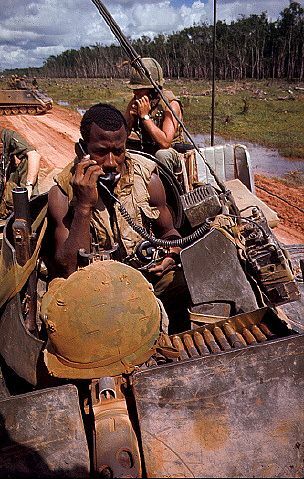 United States 25th Division troops ride on top of M113 Armored Personnel Carriers (APC) in Ambush Alley, on the Tay Ninh-Dau Tieng road, 1968. These vehicles were designed to be portable by aircraft and were fitted with a lightweight aluminum hull armor and used special caseless ammunition in its main gun. As a result, the vehicle was vulnerable to mines and missiles and the ammunition frequently caught fire, incinerating the vehicle and its crew.